What really floats my boat when it comes to this hobby is discovering something I haven’t seen before. Having stayed at more Maldives resorts than anyone in the world, as well as regularly researching and scanning the digiverse for the latest developments, it’s harder to stumble upon something I haven’t seen. By my recent Instagram trawling yielded this nugget from Constance Halaveli. 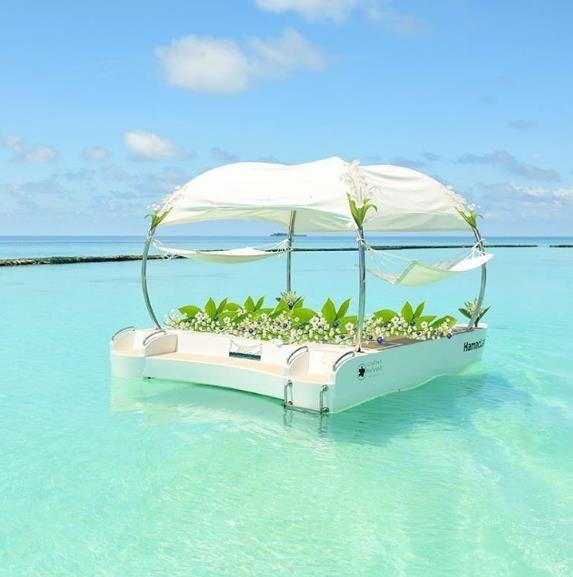 A HamacLand canopied garden raft described as “a cross between a personal island and a private VIP floating lounge”. Complete with his and her hammocks for swaying in the gentle ocean breeze and undulating ocean current. Yoga enhances the whole person – mind and spirit. But some poses can be particularly effective at helping certain parts of the body. Each week, our yoga teacher asks us what is hurting and what we want to focus on. Sometimes a tender back will call for a few extra twists and Child Poses. She worked on our hips and arms to get us ready for the golf course in the spring. 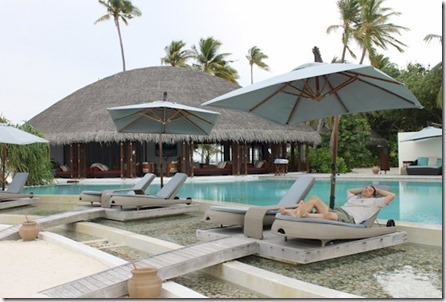 One of the most apropos yoga specialisations have been offered by Constance Halaveli – dive yoga. Diving is about body control. 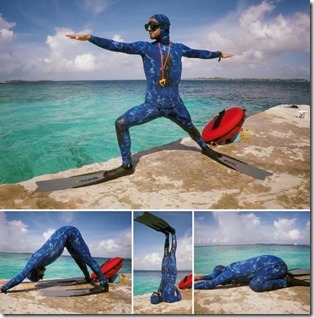 Slow and deliberate movements are the focus for both yoga and diving. But perhaps most of all is the breathing. Yoga turns this autonomic routine in a mindful practice. A scuba diving is all about the breathing. Breath control not only regulates how long you get to stay under water (making your oxygen last longer), but it actually controls your movement in the water. Take a deep breath filling your lungs with air and your increasingly buoyant body will slowly rise. Exhale, and your body will sink again. 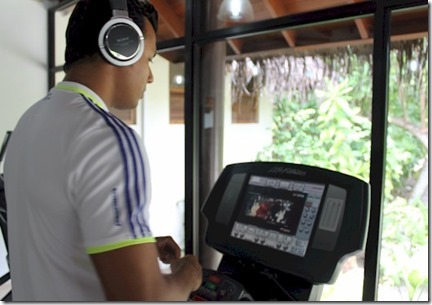 For those preparing for the next Red Bull race or just preferring a more sheltered, less pressured running workout, then Constance Halaveli’s fitness centre offers the Lifefitness 95T machine. My wife Lori is a bit of an aficionado of these devices (appreciating the distractions of the TV show to mitigate the workout pain), and she informs me that it is the Mercedes-class of running machines and the best on she has come across in our extensive Maldives travels. 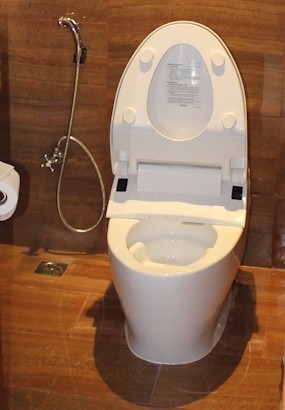 For the digerati who want the latest gadget to enhance their day, Constance Halaveli has deployed the most sophisticated in room guide we have come across. 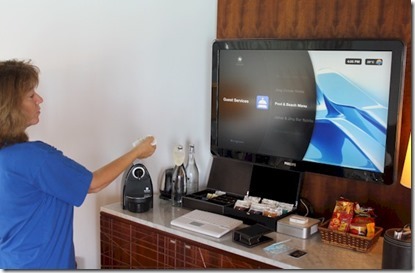 The TV remote driven application not only provides a range of films and television on demand, but also controls the room’s sound system (we listened a soothing range of ambient playlists during our stay) as well as offers a range of guest services and resort information. No heart-shaped beds yet (jacuzzi, yes), but a round one. Conrad Rangali has one centered in its sunset water villa master bedroom like a giant bulls-eye. 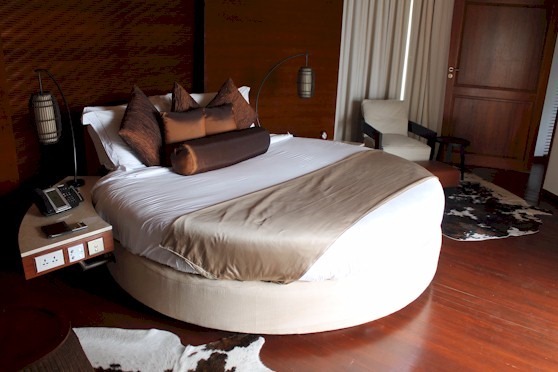 But the circular crib at Constance Halaveli tipped the feature today with the swoosh of a bedside stand and the round villa that lends a curvy Corbusier feel to villa. South Africa Freedom Day today. And no better way to toast the new, modern generation of South Africa than with one of its delectable wines. 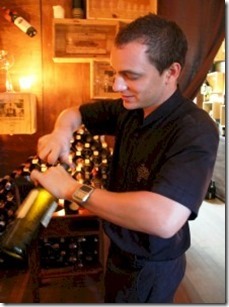 At each resort we visit, Lori and I always enquire about what’s a bit unconventional and we haven’t had before. 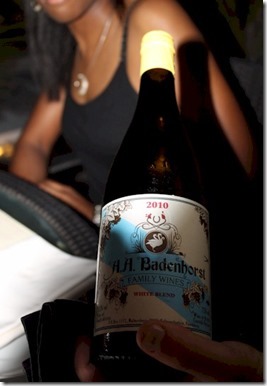 And when Lori and I visited Constance Halaveli, the sommelier Cedric Jacob, served up some delightful South Africa varietals including A.H. Badenhorst (see below). 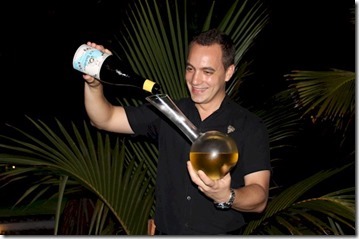 We are no strangers to South Africa’s fermentations, but Halaveli’s extensive collection was the broadest we had seen in the Maldives. This vineyard in Swartland, North of Stellenbosch, produces this 9 grape young vintage blend, mostly Chenin Blanc (30%) which is “quite engaging, very complex” as Cedric describes. 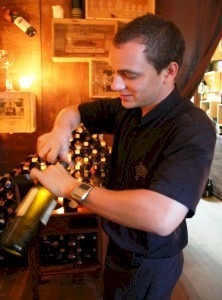 Constance Halaveli is a bit of a specialist in Southern Hemisphere wines with their distinctive Brazilian offerings as well. If you prefer your seaside fun in the sun to be more loud, boisterous and frolicsome, then Brazil’s Carvinale starting today offers the energetic antonym to Maldivian idyll. Especially with World Cup Rio just weeks away and the Summer Games in Rio next on the Olympiad calendar, all things Brazilian will have a bit more cachet and buzz these days. If private shades are your thing, then Constance Halaveli offers it right out in the main pool. Mini, canopied private jetties are built over a shallow rock pool looking out towards the beach and ocean. Like having your own private deck but with a beach view (which water villas won’t give you) and instant access to a quick Olympic-sized freshwater dip. After all that horizontal tandem activity, Constance Halaveli brings a new vertical dimension to some tandem rest. Our kids always enjoyed a bit of “sleep over” ambience on our holidays where they invariably stayed in the same room and chatted surreptitiously in the dark while Mom and Dad got in a few more chapters on the deck. 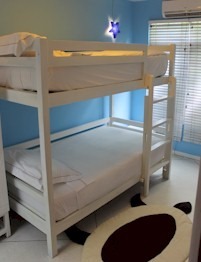 Despite their camaraderie, except at the very youngest age, they started to want their own beds, but often twins were hard to come by at resorts. Sometimes one could improvise sleeping on a couch or day bed. But Halaveli’s bunks are a great solution that my children would have adored (though definitely would have prompted many fight over who gets the top bunk). Not only can you find a “Best of…” for just about anything in the Maldives these days, you can also find a declared “Day of…” just about anything as well. And today is “World Toilet Day”. Declared by the UN no less (with the very credible objective of raising awareness of sanitation issues in less developed areas of the world). 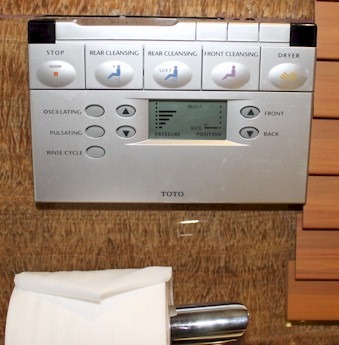 Constance Halaveli celebrates the pinnacle of hygiene convenience and technology with the latest Toto Neorest model featured in its Presidential Beach Villa. No spouse arguments over leaving the seat up as it automatically raises and lowers the seat for you. 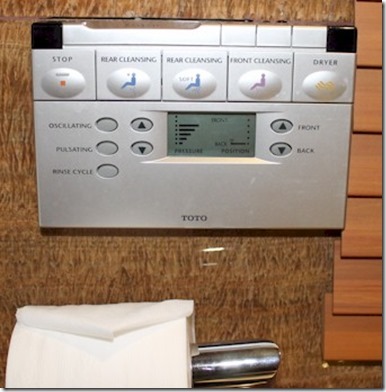 And I guess you can get a more aptly labelled gadget button than “Rear Cleaning” (see below).